It’s that time again—time to relearn how your MoviePass subscription works. As the dirt-cheap theater-subscription service struggles to find a path to viability, it continues to tinker with its plan. On Thursday, customers were notified that surge pricing will now be applied to films at the most popular showtimes. In an example, MoviePass showed the latest Avengers film with a $3.43 fee tacked on top of the $10 monthly fee. But the company says it could be higher than that in some cases. We reached out to MoviePass to ask what the exact range of price increases will be, and a spokesperson told us it should fall between $2 and $6. If a particular movie is attracting a high level of attendance, some sort of magical algorithmic calculation will happen and you’ll be informed of the extra fee. Once you agree to the charge it will automatically be applied to your credit card. MoviePass also told us that this is still just a testing period with some subscribers and will roll out to everyone on the service in “the next few weeks.” Fortunately, if you signed up for the annual or quarterly plans, everything will stay the same until it’s time to renew. A “Peak Pass” will also be introduced soon that allows users to skip the fee once a month—a welcome caveat that makes the service even more confusing. Because this is MoviePass and its leaders seem to just be making it up as they go along, it’s difficult to say what you should read into that $3.43 example. Maybe the average surge price will be lower and they’re trying to set your expectations high. Maybe it’ll be higher and they don’t want to piss you off too much with the screenshot. Considering the company’s financial troubles, you should probably brace yourself for as high a fee as customers will handle. 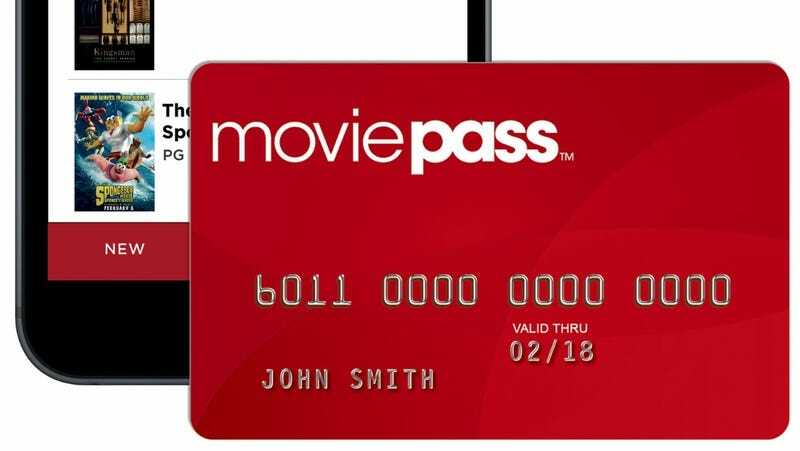 MoviePass has reportedly been surviving on a $300 million line of credit that was projected in April to last about 17 months. At the time, it was spending $21.7 million a month to subsidize all those movie tickets it purchases from theaters at full price. But it must keep growing to gain more leverage as it negotiates with theaters and studios to cut it in on profits. By May, it was shelling out $40 million a month. In June, it hit 3 million subscribers and estimated it would have 5 million by next year. As it grows, its timeframe for survival is narrowing, and earlier this week it told federal regulators it wants to raise another $1.2 billion from investors. If MoviePass doesn’t manage to pull this wacky scheme off, the good news is, it has paved the way for services like Sinemia and AMC’s Stubs A-List. While those services don’t offer the ability to a see a movie-a-day at any theater for $10, as MoviePass does, they’re both really good deals. In the meantime, if you don’t want to pay a surge fee, just use MoviePass the way it’s intended—take a chance on some random movie you wouldn’t normally pay for and enjoy yourself.